Teachers have been engaged in conflict with provincial governments since the beginning of the year, as inflation continues eating into their wages. The conflict between the government and the teachers' union continued Wednesday, with unions across the country adhering to a 24-hour strike to coincide with the vote in Congress of the 2019 Budget. The Budget was designed "on the order of the International Monetary Fund", the CTERA teachers union confederation said, describing the Mauricio Macri government's economic agenda as "brutal austerity" for the education sector. 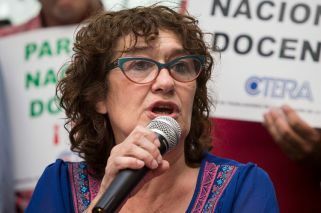 "Our struggle is not only wages, we're also defending the right to education", CTERA's president Sonia Alesso said. The teachers unions' protest starts at 9am in front of the Pizurrno Palace, headquarters of the Education Ministry, and continues to Congress. Wednesday's strike is the latest in a series of decisions by unions. Teachers in Buenos Aires province walked off the job on Thursday and Friday last week to reject the María Eugenia Vidal government's offer of a 30-percent wage hike. Inflation in Argentina is estimated to reach over 40 percent this year.